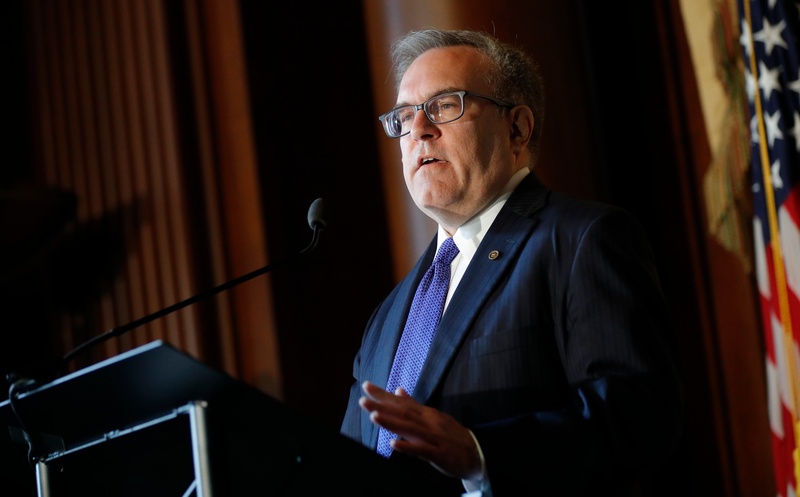 EPA Chief Andrew Wheeler suggested the Obama administration pushed U.S. climate report authors to hype “worst-case” scenarios. Former Obama science czar John Holdren said that was “false,” but neglected to mention a 2015 memo contradicting his point. The recent U.S. climate report focuses on “worst-case” predictions that experts are increasingly questioning. Environmental Protection Agency (EPA) acting Administrator Andrew Wheeler suggested the Obama administration told the authors of the latest National Climate Assessment (NCA) to emphasize “worst-case” global warming predictions. “And I don’t know this for a fact — I wouldn’t be surprised if the Obama administration told the report’s authors to take a look at the worst-case scenario for this report,” Wheeler told The Washington Post in an interview Wednesday. Wheeler isn’t the first to criticize the NCA’s focus on “worst-case” global warming predictions, but his comments sparked backlash from former President Barack Obama’s chief science adviser. John Holdren, Obama’s former science czar, told Politico that’s “absolutely false.” Holdren said the report considered a wide range of scenarios, and that he had no role in selecting the fourth NCA’s authors. “My only instruction was that the USGCRP should continue the distinguished tradition of the first three by drawing on the most current peer-reviewed science to illuminate what climate change is doing and is projected to do across the geographic regions and economic and ecological underpinnings of well-being in the United States,” Holdren said. However, Wheeler does have a point. Holdren did not mention a May 2015 memo from the Subcommittee on Global Change Research’s (SGCR) environment committee, which is part of the White House National Science and Technology Council. 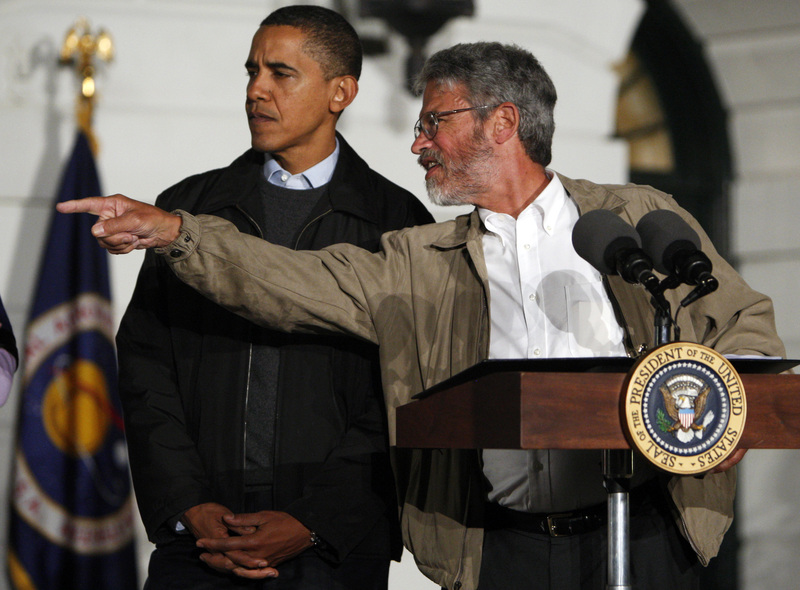 U.S. President Barack Obama (L) gets direction from White House science adviser John Holdren during an event to look at the stars with local middle school students and astronomers from across the country on the South Lawn at the White House in Washington, October 7, 2009. REUTERS/Jim Young. The SGCR memo instructs NCA authors to “focus on RCP 8.5 as a high-end scenario and RCP 4.5 as a low-end scenario.” The memo says using RCP 8.5 and RCP 4.5 “as core scenarios is generally consistent with the range of emission scenarios used in” the third NCA. “In addition, using a low-end and a high-end scenario will facilitate communications of assessment findings,” reads the memo. SGCR is made up of executive branch officials and is overseen by the White House Office of Science and Technology Policy (OSTP). Holdren headed OSTP at the time the memo was issued. RCP 8.5 is considered a “business as usual” scenario where nothing is done to cut emissions. The latest NCA’s dire predictions of future global warming lean heavily on RCP 8.5 — indeed many parts of the report only reference the alarming results of RCP 8.5 modeling. However, experts have increasingly challenged RCP 8.5 as highly unlikely and unrealistic. University of Colorado professor Roger Pielke, Jr. criticized the NCA’s use of RCP 8.5 as a “business as usual” (BAU) scenario in order to justify policies to cut greenhouse gas emissions. RCP 8.5 is problematic not because some use it as a “worst case” scenario (reasonable people can disagree on that), but when it is used as a BAU scenario, to predict future impacts & ground CBA. That is a misuse of the scenario. RCP 8.5 as BAU is implausible, as per IPCC. “A shame because justifications for climate policy don’t need exaggeration,” Pielke tweeted on Wednesday. In the NCA RCP 8.5 is presented both as an extreme scenario & as BAU. This is (a) sloppy, but also (b) a “thumb on the scale” for expressing IAM results for future impacts and benefits of mitigation. A shame because justifications for climate policy don’t need exaggeration. The Obama administration began the process of drafting the fourth NCA, but much of the work, including drafts and reviews, took place under the Trump administration.